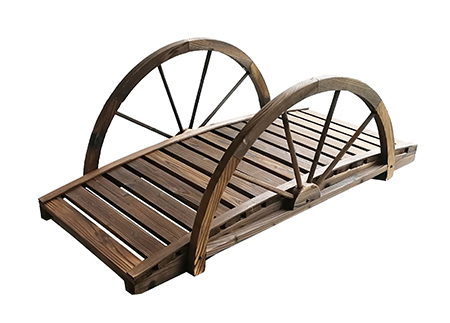 Wood garden bridges made of anti rot solid wood, sturdy design, perfect for walking paths or placing over small stream. Characterized by double railings and arch frame, this old fashioned wooden bridge is a great decoration to garden, backyard. Antique flame burnt brown finish brings back old memories. Natural finish wood bridge is ready for any of your paint work. Assembly holes predrilled, screws and bolts for assembly supplied.